Post An Opportunity - it's free! Complete the form below, or e-mail mark[at]cubreporters.org . 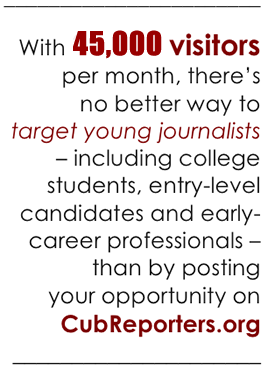 It's FREE to post a journalism job, internship, fellowship, free program or scholarship on CubReporters.org. Please note: we do not list jobs or internships that provide no compensation (there should at least be a nominal stipend) nor will we post programs that charge fees. However, you may purchase an advertisement for $25.